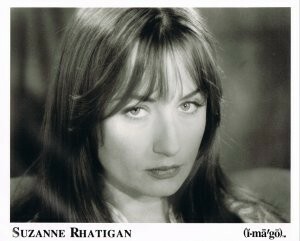 This entry was posted in FIFTY and tagged R&B Singer songwriter by Suzanne Rhatigan. Bookmark the permalink. Hi Suzanne, we had an interview for German “Wiener” magazine back then. You were on promotion tour and had an excellent and energetic “Unplugged” Session at Babalu Club in Munich – and what a great gig that was! Thanks for sharing the story about your feelings when recording the album. Just wanted to say that I still think “The Further in we Go” is a real R&B masterpiece, and it touches my heart as much as it did in 1992 when I was reviewing the album. Good luck for your further musical adventures! Thanks for the memory Anatol. That was a fun gig. In fact an improvised song recorded on the night made it onto a CD release I think. The song was called ‘New Suit Blues’ I don’t remember which CD though Is the club still there? I am in Munich regularly visiting family I would love to check it out, maybe even do a gig! I hope to have new music out soon!! I love “To Hell With Love”. It’s hard to pick favorite songs, but “The Further in We Go”, “The Spinner of Years”, “All You Ever Need”, “Shelter Me”, and “To Hell With Love” itself are right up there with some of the best blues and folk songs I’ve ever had the pleasure of listening to. Hindsight is a great thing isn’t it? I had gotten an Aimee Mann CD from Imago and your album was advertised in it so I took chance thinking who is this cute girl? The write up must have been good cause I never do that and did I mention you were good looking? I was very pleased with the variety of music and have turned on a few people to that album. With the power of the internet I found you again years later and was again turned on to more variety which is the spice of life. I especially like the grundgier sounds you have-kudos to your soundmans patience. Not knowing the industry, I just know good music when I hear it-and you got it! I was not there for the recording of the record but joined in for touring, videos ,etc. after the fact . I think the record was a great first effort perhaps a bit ahead of it’s time even. Suzanne’s singing was always brilliant and I’m sure it is today as well. She was always her harshest critic but thats the way most great artists are. Sounds excellent today and also did then . it’s a hard business most fail. I bought “To Hell With Love” one day in ’92 at THE campus record store at the University of Illinois, along with Sophie B. Hawkins’ “Tongues and Tails” and Celine Dion’s “Celine Dion”. I was on a new female artist bent that day, new to me anyway. I had not heard any of you previously. All three of you ladies moved me, in as many different ways. And all three albums remain at the top of my favorites to this day. I felt then, and still do, that your album had wonderful continuity, telling the story of a struggling young woman coming into her own. I have followed you since then, devouring anything I can find. This collection of 50 “misses” is a true treasure. Keep on rockin’ SR! !